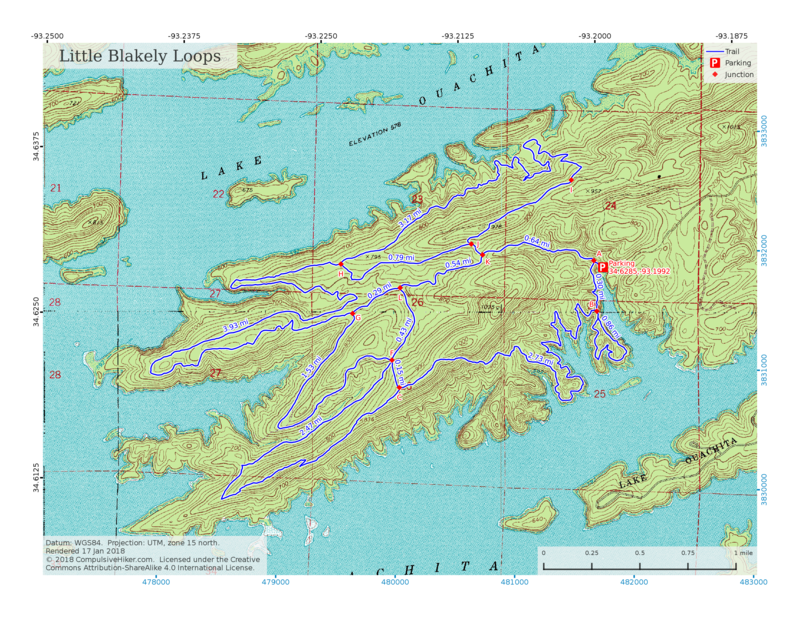 The Little Blakely Loops consist of about 18 miles of trail in 5 loops plus connectors on a peninsula on the east side of Lake Ouachita. This is USFS property north of the state park. USFS info. Trail head is at 34.6285, -93.1992. Jan ’15 trip, Nov ’15 trip. If I lived closer, it would be my preferred place for a regular day-hike. The best place for lake views is south and southwest of the parking area where the trail hugs the shoreline. Updated Jan 17 2018: Freshened the map style. Updated 8-14-16 only to freshen the symbol styles and make it consistent with my other maps. Updated 11-8-2015: I got tracks for the missing trail segments so the map is now complete. Click on the image to get it full-size. Every time I update the map the image will have a different name so if you want to bookmark or share the map, link to this page – not the image. Will print at 1:24000 scale on 8.5×11 paper. Great map! One of the few that is truly accurate. Thanks for the map. Did the hike yesterday and had some confusion at K. We were trying to go from K to H, but ended up at F. Wrong direction and everything. Probably user error, but we were very confused. Also, for anyone using this map, it is missing E and D, but they are pretty easy to figure out once on the trial. I omitted points E & D since they weren’t junctions. I’m not sure I even saw markers for them.